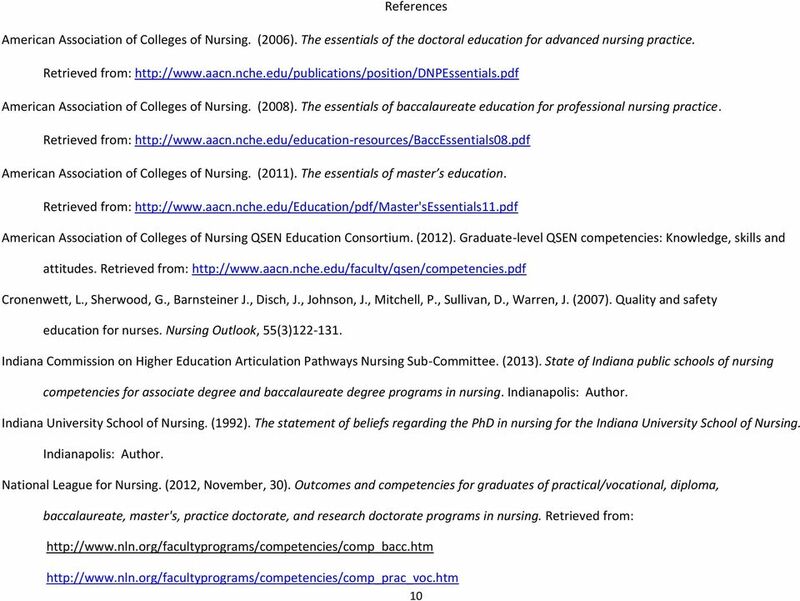 Download "NLN Competencies for Graduates of Practical/Vocational Programs (2012) which LPN Programs shall meet." 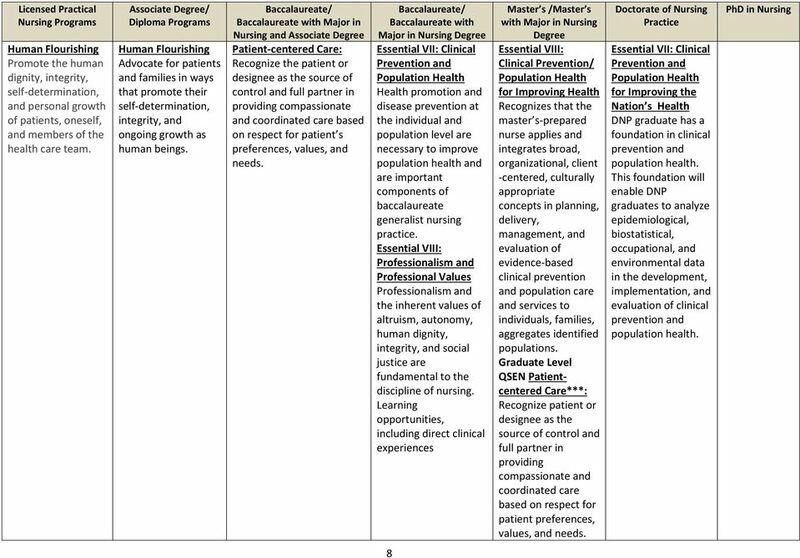 9 Major in Essential IX: Baccalaureate Generalist Nursing The baccalaureate graduate nurse is prepared to practice with patients, including individuals, families, groups, communities, and populations across the lifespan and across the continuum of healthcare environments. 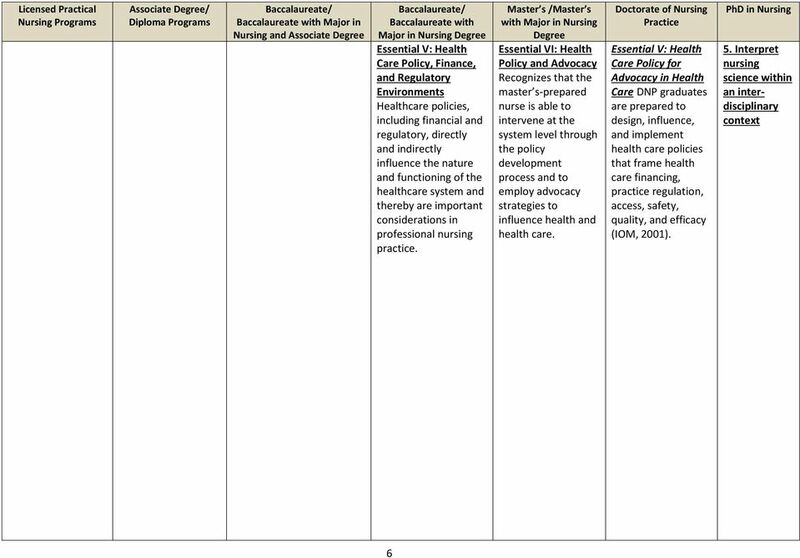 The baccalaureate graduate understands and respects the variations of care, the increased complexity, and the increased use of healthcare resources inherent in caring for patients. 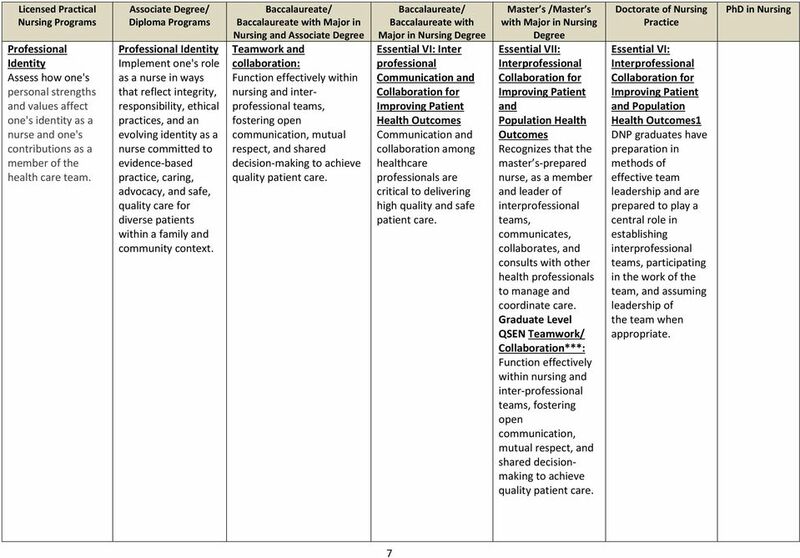 9 Essential IX: Master s-level Nursing Recognizes that nursing practice, at the master s level, is broadly defined as any form of nursing intervention that influences healthcare outcomes for individuals, populations, or systems. 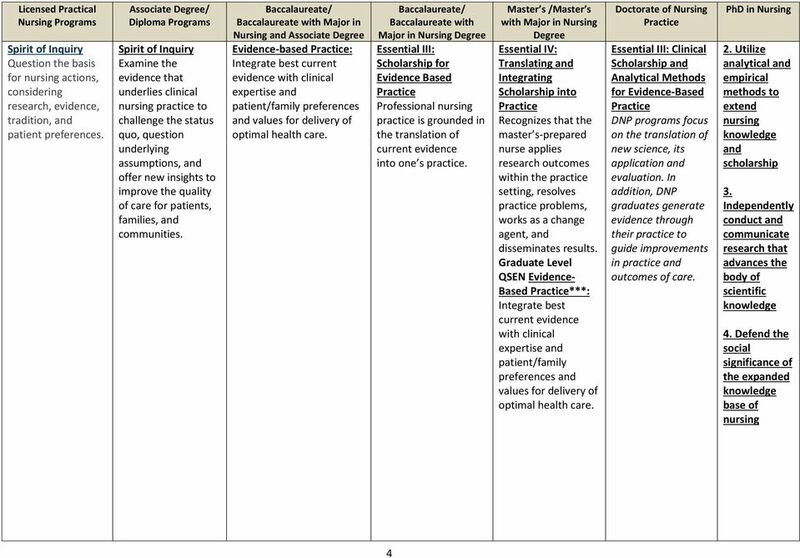 Master slevel nursing graduates must have an advanced level of understanding of nursing and relevant sciences as well as the ability to integrate this knowledge into practice. 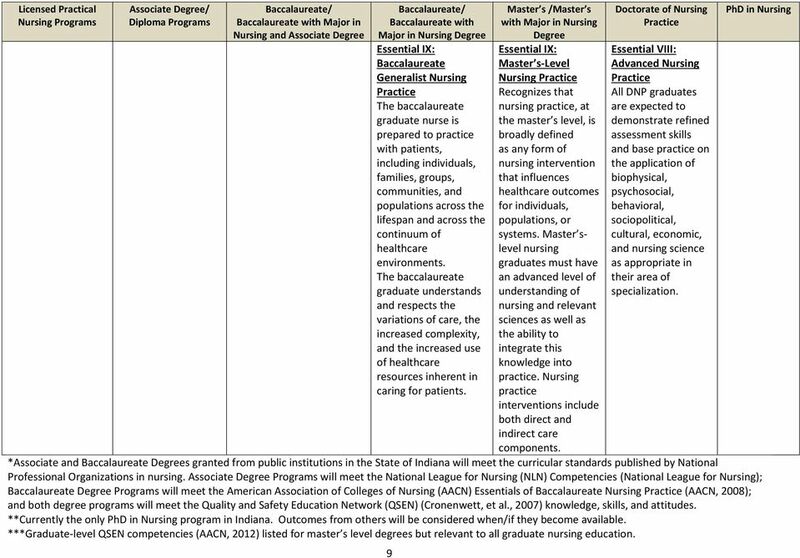 Nursing practice interventions include both direct and indirect care Essential VIII: Advanced Nursing All DNP graduates are expected to demonstrate refined assessment skills and base practice on the application of biophysical, psychosocial, behavioral, sociopolitical, cultural, economic, and nursing science as appropriate in their area of specialization. components. 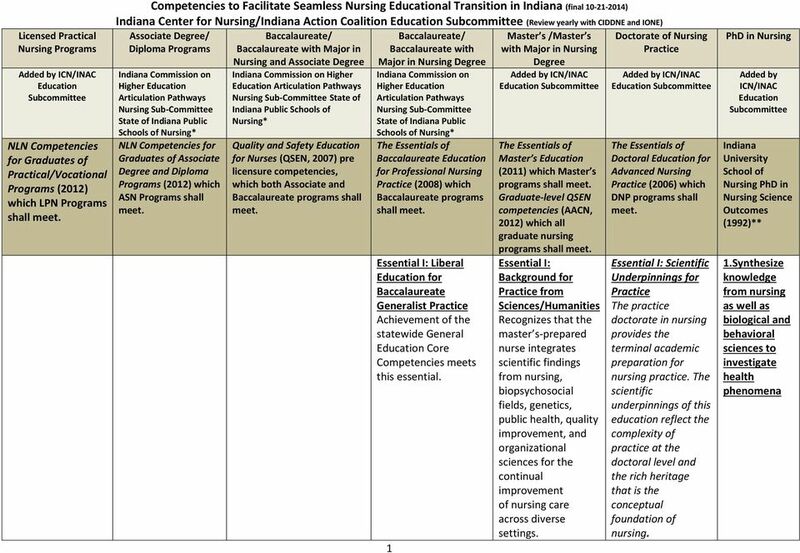 *Associate and Baccalaureate s granted from public institutions in the State of Indiana will meet the curricular standards published by National Professional Organizations in nursing. 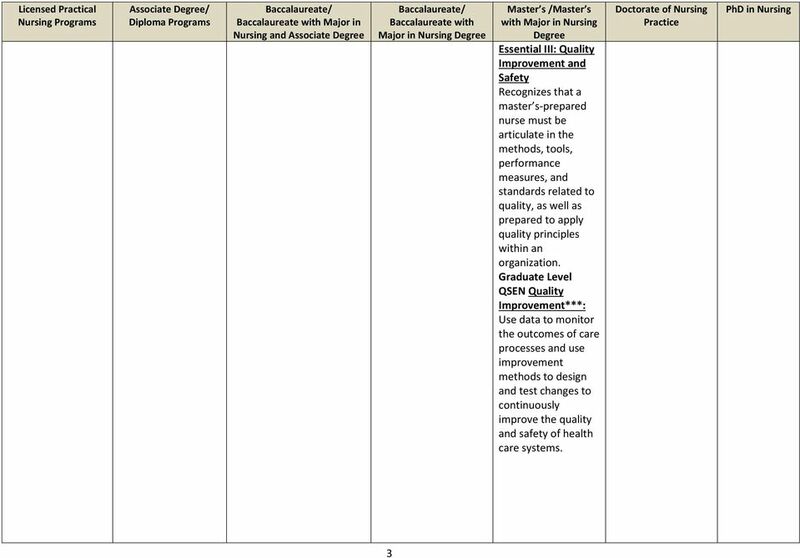 Associate Programs will meet the National League for Nursing (NLN) Competencies (National League for Nursing); Baccalaureate Programs will meet the American Association of Colleges of Nursing (AACN) Essentials of Baccalaureate Nursing (AACN, 2008); and both degree programs will meet the Quality and Safety Education Network (QSEN) (Cronenwett, et al., 2007) knowledge, skills, and attitudes. **Currently the only program in Indiana. Outcomes from others will be considered when/if they become available. 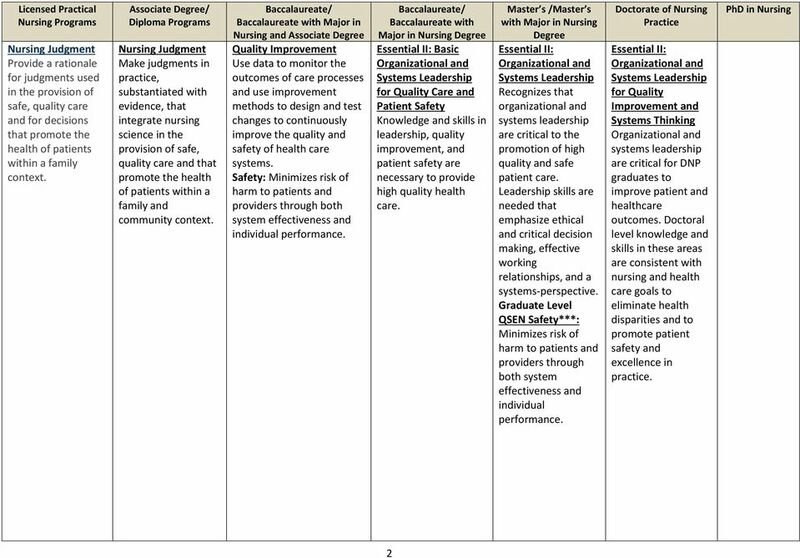 ***Graduate-level QSEN competencies (AACN, 2012) listed for master s level degrees but relevant to all graduate nursing education. 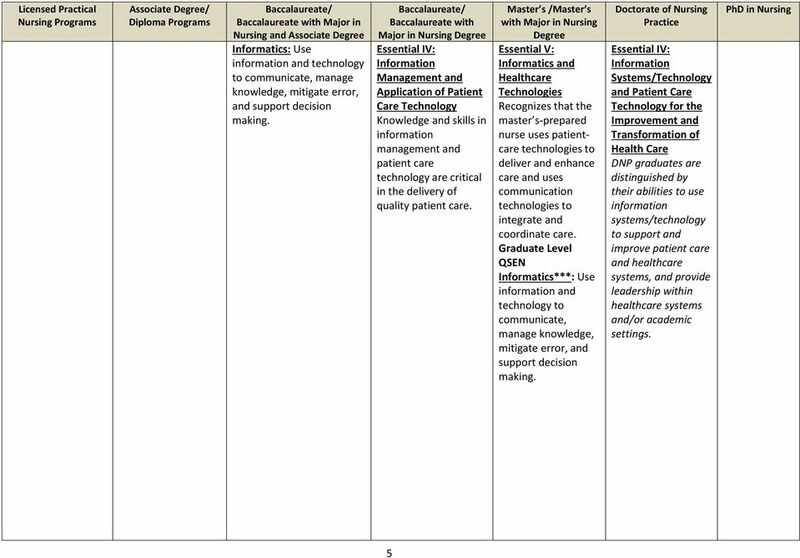 Core Competencies Faculty name Student name Metrics: Very 1. Communication and Informatics Collect, manage and organize data to produce information and meaning that is exchanged by use of signs and symbols.